For one day, Vancouverites can see with their own eyes how an oil tanker spill might destroy one of the city’s most popular beaches. Using Oculus Rift-powered, coin-operated binoculars, Victoria-based environmental group Dogwood Initiative showed what the scenario could look like on Wednesday: oil fires on English Bay, bitumen-soaked sand, and a dying orca in the distance. It’s a stunt the group’s energy and democracy director Kai Nagata hopes will “remind citizens that this is only one possible future” amid proposals to increase tanker traffic. He elaborated on the risks beyond a devastated beachscape. He referred to lessons learned after a spill that affected Michigan’s Kalamazoo River in 2010, in which a ruptured Enbridge pipeline unleashed 3.3 million litres of oil into an extensive watershed in the state’s southwest. The main takeaway from that spill, according to both Nagata and the U.S. Environmental Protection Agency, is to remove bitumen from water surfaces as soon as possible. There are currently two ways to remove bitumen after a spill: burn it or spray it with chemicals dispersants so make it dissolve into the water column. “When diluted bitumen hits water, the heavy oil compounds sink to the bottom and the toxic gases just evaporate into the airshed,” he said. “So just imagine that, but on a scale where there’s two million people living in the region,” he said, referring to B.C. 's heavily-populated Fraser Valley. Vancouver Mayor Gregor Robertson stopped by to check out the oil spill scenario. 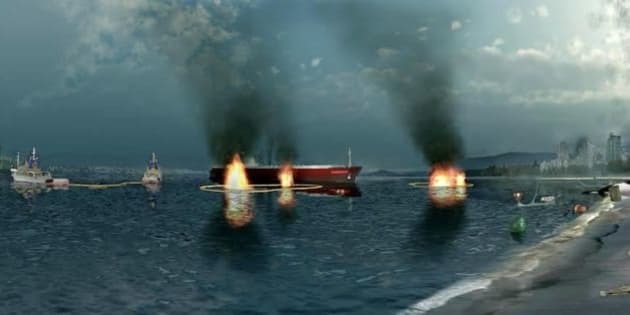 Oil spill animation effects were created by local game developers Adrian Crook & Associates and Factory 1 Studios. The province’s oil spill response plan has long been the target of criticism, chided by opposition politicians, advocacy groups and residents for its lack of scientific support. “They like to claim we have world-class spill response standards. Clearly we don’t, and this email proves it,” said NDP MLA Spencer Chandra Herbert to CBC News.